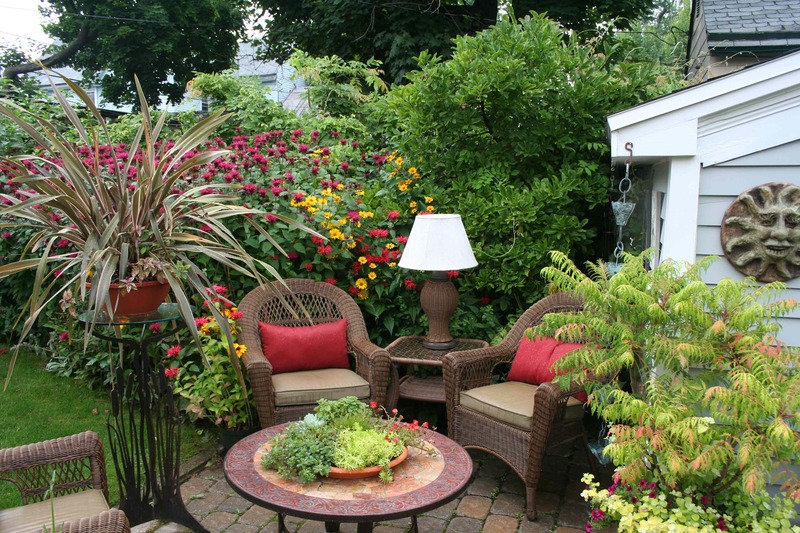 Who wouldn’t enjoy talking gardening with their neighbor in this setting? If there is one thing I took away from my weekend in Buffalo with my fellow garden bloggers (other than a serious case of plant envy — which will be discussed at length later), it is the conviction that gardens really do have the power to bring communities together. We toured several gardens in different neighborhoods that will be part of the Buffalo Garden Walk the last weekend in July, when about 350 gardens in the area are opened to visitors. The tour is free, and any homeowner can put his or her garden on the tour. Nearly 50,000 people take the tour each year, making it the biggest garden tour in the U.S. The openness of the tour guarantees that the garden walk is not just a tour of show-places, but a tour of neighborhoods and the gardens and homes that give them character. We spent most of a rainy morning in the Cottage District, an area of former workers’ cottages. It’s not a high-end neighborhood at all, and in fact, was considered something of a problem area with many abandoned or rundown properties. But, the neighbors began organizing, getting to know each other, and part of that involved sharing their gardens—with each other and with the larger community. Some of the gardens such as the one pictured at left are magazine-worthy places; others more modest, but still lovely and obviously a reflection of the homeowners pride in their place. When you garden, you cannot help but notice your neighbor’s garden, too. That leads to questions, conversations, trading plants, grousing about weeds and critters and exchanging ideas. Before you know it, your neighbors are much more than just the guys or gals who live next door — they’re friends, people you care about. The presence of that sharing was evident in the Cottage District — many gardeners grew the same plants, though each garden reflected the aesthetic and interests of its owners as well as the unique site in which it was located. (Imagine gardening with a brick tower over looking your space.) There was a synergy in their gardens — and in their neighborhood. In its most basic form, that synergy is the power of gardening in community, a power that residents of Buffalo are clearly harnessing. I love that idea. Maybe gardening is the answer for bringing communities back together again? I live in a rural area where we can’t share our gardens on a street as they do in the Cottage district, but we gardeners do get together to enjoy being an active part of our community by using our passion and energy to improve local public areas – and grow food for the food pantries. We do share plants and so on, but, unlike 16th street, no one person actually gardens other properties on the block. That is unusual. I do enjoy planting the containers and public spaces in our neighborhood though. Your magazine is really cool! Thanks for sharing it. As a country gardener, I was also struck by the power of a passion in community. I am lucky to have gardeners around me but these city gardens and gardeners have a sense of closer community. It was good to meet you, Mary. Your magazine is a delightful read and helped with the trip home.